Email, Phone or Fax Talune for all your area inquiries, cabin availability, bookings etc. Winter and long term rates negotiable. 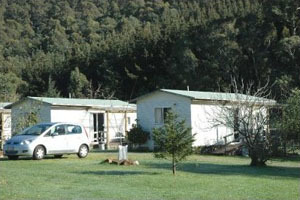 Talune Farm Cabins are situated 4km from Cygnet and 50km south of Hobart. The reasonable rates make it an ideal base for seeing not only the south but further afield. The Huon area has a lot to offer, the far south walks,the caves at Hastings, Tahune airwalk at Geeveston and the jet boat rides at Huonville. There are beautiful drives around the DEntrecasteaux Channel and the ferry to Bruny Island is only 20minutes away. On a rest day you can enjoy the country tranquility and watch the native birds including wedge tail and sea eagles. 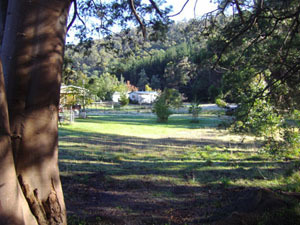 In the evening you might see a platypus in the creek and at night time there are possums, wallaby, bandicoots and quoll. 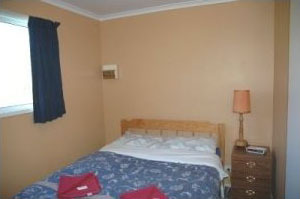 The cabins are fully self contained.Each cabin has a bedroom with a double bed and a small bunk room with triple bunks. There is a bathroom with a toilet and a bath with a shower overhead. The kitchen /living area has a TV and electric heating ,full sizedstove, microwave, fridge and kitchen utensils. All linen and towels are provided. Once the home of Talune Wildlife Park TALUNE WILDLIFE PARK CLOSED IN 2002 Talune now operates as a small Lowline ( miniature angus ) hobby farm so you will be able to see these 'little cows' and other farm animals when you stay with us.